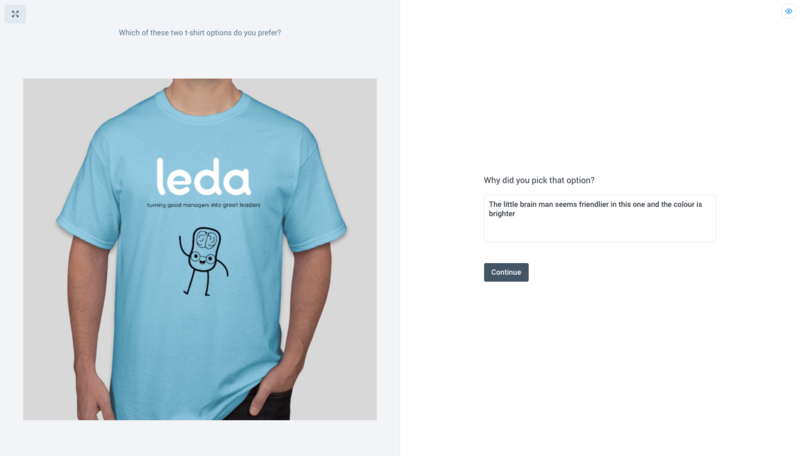 Which T-shirt design will my users most appreciate? If you’ve ever run a promotional giveaway before, you’ll know firsthand that it can be agonizing to choose which design to go with. Apparel print runs are expensive, and only get more expensive when you start experimenting with printing multiple designs in different colors. You may have just one shot to get it right. This means that figuring out which of your designs resonates best with your audience is an important part of the process — and you can get a lot of useful feedback by running a preference test to compare your front-running designs. It’s best to keep the questions simple with preference tests. Stick to asking users for their preference, and a ‘why did you choose this option’ question to collect general feedback on the preferred design. When it comes to recruitment, run this test with a subset of your real audience if at all possible. Fall back on your mailing list, social media pages or customer database to make sure that you’re hitting exactly the right people. When you’re diving into the ‘why’ text responses, be sure to filter them appropriately. Click the ‘filter’ icon in the response row to isolate the relevant responses. This will help you to collate design feedback accurately and quickly. When it comes to analyzing the results, we do some calculations to help you out, but there’s no hard and fast number that designates a design as a success. However, be aware that giving users more options will spread their responses, giving you a hazier picture. To combat this, narrowing the options down to two or three alternatives will help users make a choice, which you can then turn into a piece of clothing that your audience will be proud to wear.